It doesn’t get much more remote than a wooded island in Botswana’s Kalahari savannah. So when the Feline Fields Lodge boasts absolute exclusivity and privacy, it’s less of a sales pitch and more of an assurance. Within the lodge’s series of independent suites — each one a raised structure made from sustainably farmed hardwoods — a rustic interior offers a seamless segue from the raw beauty beyond. Imagery of local wildlife is interspersed with modern fixtures and mosaic mirrors, while bespoke furniture surrounds softly draped canopy beds that offer real sense of luxury and comfort. Designed by South African architect Alwyn Petersen, each space at Feline Fields is subtly composed with the temperature in mind. An absence of walls encourages cooling breezes to sail through the suites, while free-standing bathtubs and showers offer respite from the thick heat. 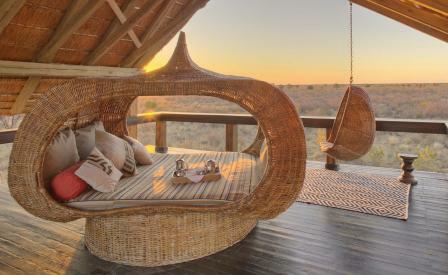 Upper decks shielded by thatched roofs make for great observation decks, with woven daybeds encouraging lounging that may be continued at the lodge’s Africology spa. As well as complete seclusion, the central Botswana location gives access to a landscape filled with magnificent wildlife, where sightings of gemsbok and zebra abound. Here, the safari experience is taken seriously. Game drives offer glimpses of leopards and the occasional lion, and wilderness adventures can be experienced on a walking safari. If just the thought of traipsing through Botswana’s heat is bothersome, a chic 25m lap pool gives both an opportunity to bask in the sun and awesome views of the elephants that frequently visit to dip their trunks in the cool water.